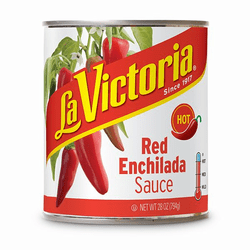 Enchilada Sauce by La Victoria - Hot 28 oz. 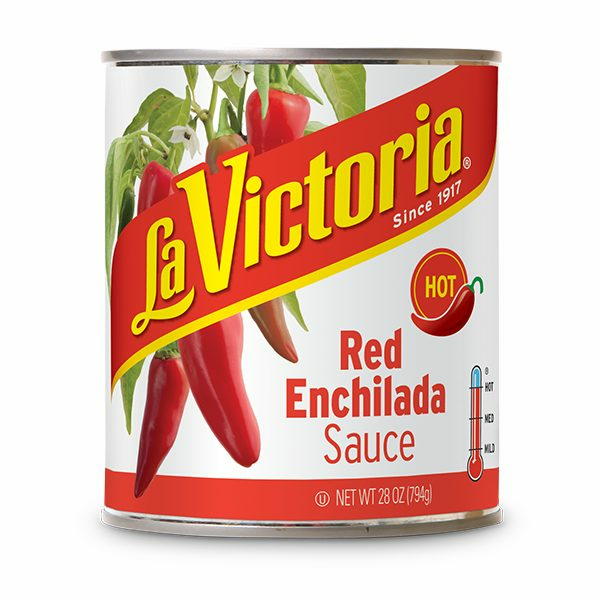 La Victoria Enchilada Sauce - Hot 28 oz. La Victoria Traditional Enchilada Sauce is the perfect sauce for enchiladas. this delicious blend of high quality red chiles is excellent for making enchiladas, chilaquiles, chili, tamales, stews and soups. La Victoria Enchilada Salsas. La tradicional salsa para enchiladas de La Victoria es la salsa perfecta para preparar unas sabrosas enchiladas. Esta preparada con chiles rojos que le dan un color a tus enchiladas, tamales, chili con carne, caldos y sopas Mexicanas. Sopa de tortillas. This is by far the best Enchilada Sauce ever made! It's got the perfect kick that puts it in the amazing category. No boring ingredients in this--just the perfect combination of tomatoes and peppers that enhance my combination of roasted chicken, sharp cheddar, sweet corn, black beans and cilantro. Forever changes your perception of canned enchilada sauce. Married into a Mexican family and "La Victoria Enchilada Sauce HOT is the only enchilada sauce my family will use, but it has to be the HOT enchilada sauce. For the last month I haven't been able to find the La Victoria Enchilada Sauce HOT at any grocery stores in Phoenix. I've searched 99 Cents Only, AJ's Fine Foods, Albertsons, Bashas', El Super, Food City, Fry's Food, Los Altos Ranch Market, Safeway, Smart & Final, Target and Trader Joe's without success. Please re-stock the grocery stores listed. I'm starving for some fantastic enchiladas. I grew up in a big Mexican family and this is absolutely, positively better than homemade. And you have to get the "Hot" one. Only problem: less an less stores are carrying it. Please supply more to Safeways in Sacramento/Davis, CA area!! !